Price: Medium level at the bar, higher at the restaurant (yet it is the same food, although slightly shorter menu at the bar). Chef: The Italian native Tiziano Gortan was working in the kitchen of the Milan’s only three Michelin stars restaurant at that time, as the pastry chef for the rock band U2′s Tearoom restaurant at the Clarence Hotel in Dublin, At Casa Blanca restaurant in Sardinia and other desirable places until he ended up in Aspen. His experiences with gastronomic cooking were more of an adventure for the young chef who came back to his traditional Italian roots at L’Hostaria where he creates generous Northern Italian meals. Atmosphere: The bar is very popular since you get most of the excellent food for a much lower price than at the restaurant. There are photographs of Italy, its landscape and cities, hanging on the walls, traditional simple tables and bicycles hanging down from the ceiling of the bar. A quirky decoration in a rather traditional no fuss restaurant. It is usually very lively, packed with locals and visitors alike. 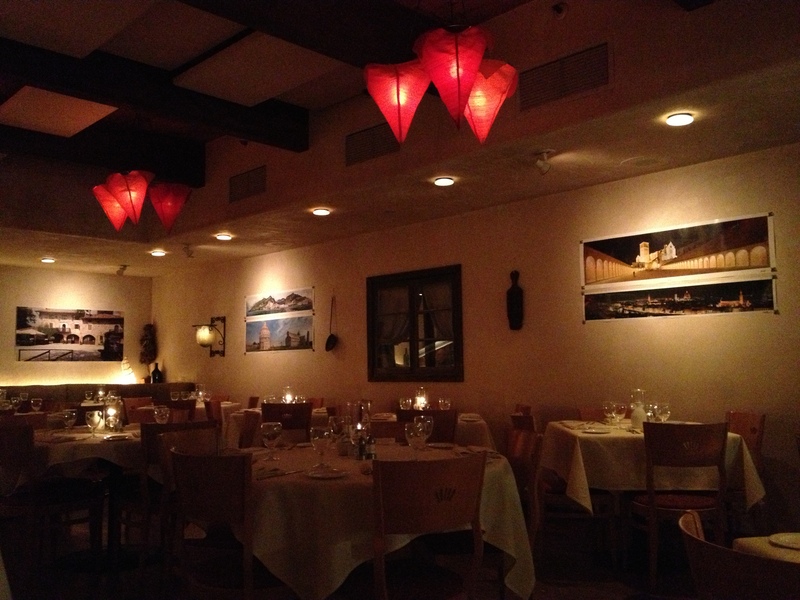 Wear casual attire and you will fit in this comfortable mecca of Italian food in the Colorado’s mountains. Food: Carpaccio in all ways from fish to meat is one of the main entry focuses of the menu. 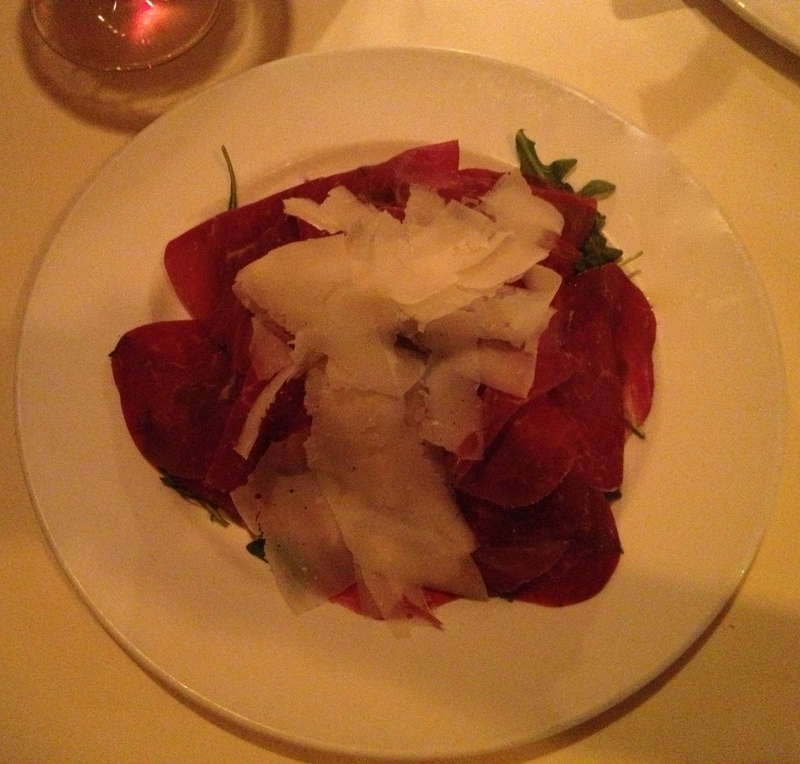 The thinly sliced Bresaola (Italian cured beef) is served over slightly bitter arugula salad and generously covered by shaved parmesan. It is a great starter especially if you order a bottle of red wine. There is also the local Colorado Buffalo, rather French minced Beef Tartar as well as the very Italian Smoked Swordfish carpaccio, all of a superb quality so just choose what your palate dictates and it is unlikely that you will be disappointed. One of my Italian favourites the thinly sliced veal tenderloin with the soundly Italian name Vitello Tonnato was seductively peering out at me from the menu so I just had to try it. As I sliced the thin veal and embalmed it generously into a light tuna sauce patted on the top my critical eye approved the tender texture and an abundance of the sauce. Then on the plate I was reassured that the chef really knows well what he does enjoying the refreshing and savoury capers and crispy beet chips together with the veal delicacy. Another temptation in the form of the Insalata d’Astice or an abundant salad of raw lobster tail, grilled zucchini, artichoke puree, cherry tomato confit, accompanied by red and green pesto, is also worth recommending. 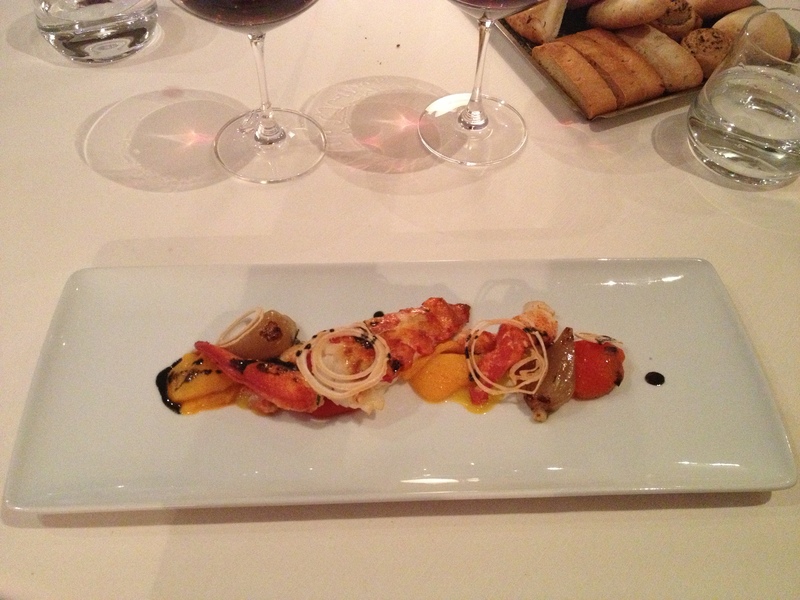 The lobster was tender and fresh and the ingredients intensely emphasised the Italian soul of this filling salad. There are also some soups and other salads on the menu. Moving to the mains one can choose from a wide selection of freshly made pastas, fish such as Branzino (sea-bass) and typical Northern Italian meat courses such at the Cotoletta alla Milanese. 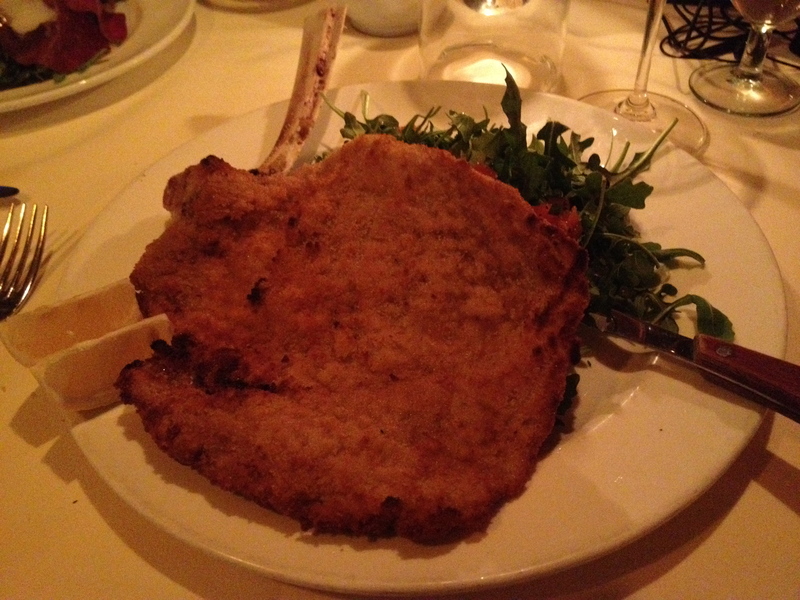 The Milanese is a large breaded veal chop flipped over green arugula and checca-style tomatoes. If done properly this is a serious contender of the Austrian Wiener schnitzel. Thinly pounded veal is though more tender, soft and more reliant of the crunchy bread coat than its Austrian thicker version usually made with other types of meat such as pork or chicken. The desserts are not less tempting so keep some space for them or at least get the Selection of Italian cheeses served with walnuts, crispy bread and honey. If it is four of you sharing the table, then you can get a special selection of four desserts and taste more of the sweets. 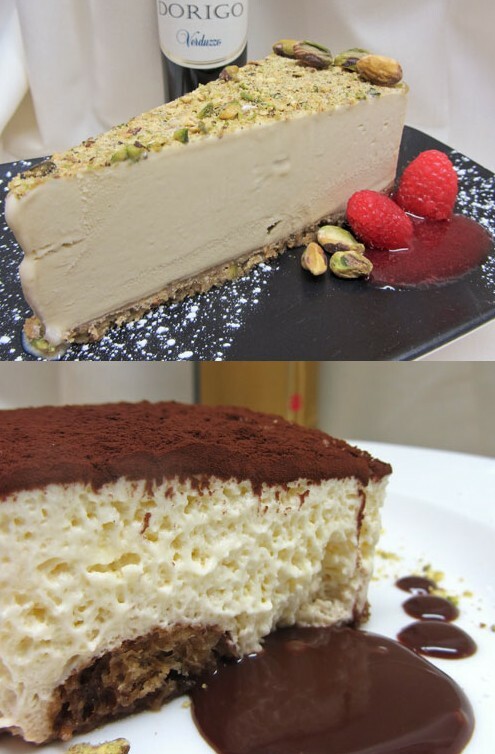 Just to highlight some – the Tiramissu is heavenly, the saliva-inducing Torta di Gelato al Pistacchio (pistachio ice cream cake with sabayon sauce on the picture) or the slightly tipsy Selezione di Biscotti e Vin Santo (selection of Italian Cookies and sweet wine Vin Santo from Tuscany) are all worth rising the blood sugar levels. Drinks: The wine list is excellent. There is a wide choice of Italian wines, which have proved to me over the years being the most suitable for the Italian food. We went for a bottle of a red Barbera di Alba from Piedmont and managed to enjoy it with all the diverse dishes. The Veal Milanese and the Bresaola were the best match though. Of course you can have the un-Italian fluffy-milky cappuccino after your dinner as most of the Italians would never have it (cappuccino is drunk only during the morning in Italy, later only espresso or the small and strong piccolo is sociably acceptable) or a cup of tea. After all you are in the mountains and tea feels good at any time of the day. Opening Hours: Daily only for dinner from 5:30–10:30 pm. Address: 620 E Hyman Ave, Aspen, CO 81611, USA. Price: High (the crème de la crème of the Italian upper class gathers here for lunch and dinner, so the prices are high). Turin is the “City where Italy was created”. 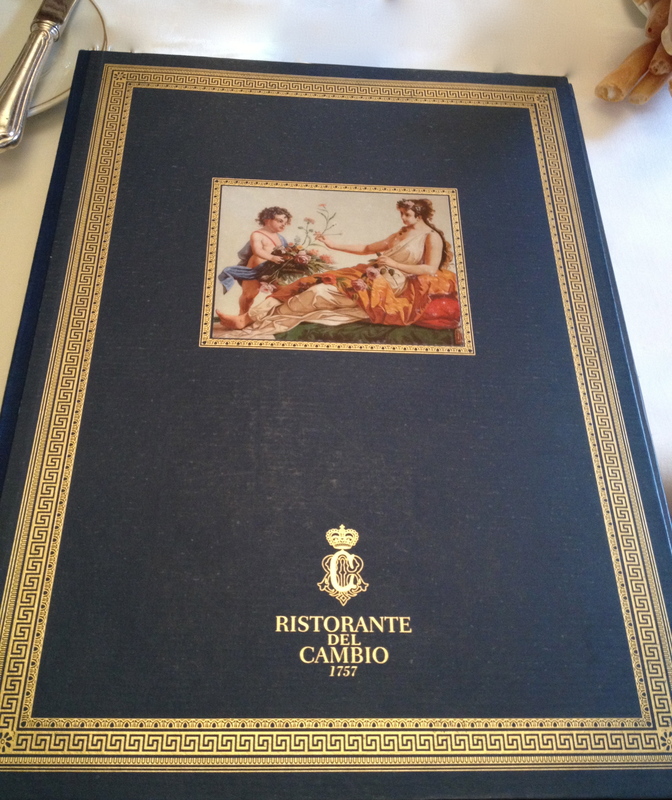 It was at the Ristorante Del Cambio, where Giuseppe Garibaldi, Cavour and Mazzini often discussed the possibility of uniting North and South Italy in the 18th century (Risorgimento movement). 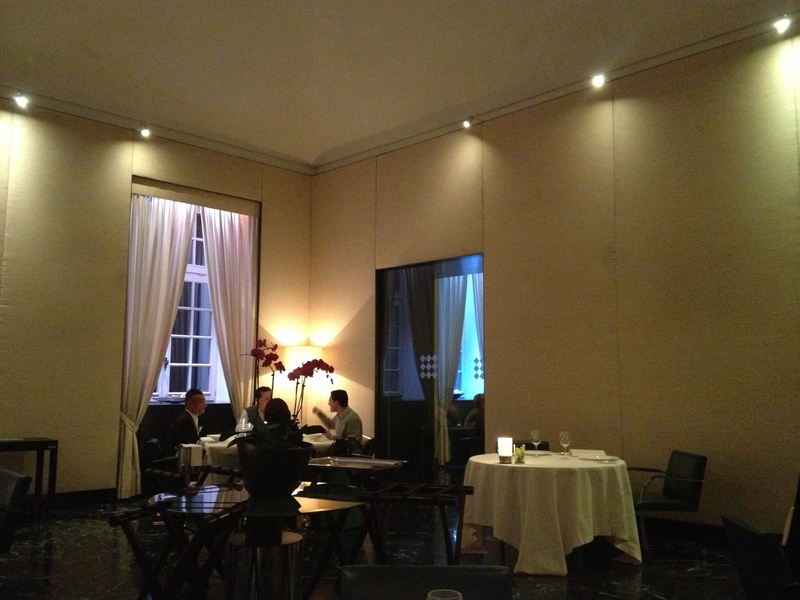 The restaurant’s location across from the first Italian parliament is not a coincidence when history is considered. Until today the back wall table overlooking the parliament building, that Cavour – one of the fathers of the nation – used to sit at, is the VIP table that is highly desirable to reserve. Atmosphere: Del Cambio is the place to be seen in Turin. Its elegant interior, historical importance and a view of the first Italian parliament are the restaurant’s strong assets attracting not only curious tourists, but also the local society. Carla Bruni is one of the current personalities reported to be a big fan of Del Cambio. It is so pompous that one would think that dressing up is imperative, but that is not entirely true. The locals are quite casual so wearing a light sweater and jeans is totally acceptable. Food: High quality ingredients, authentic recipes and lots of flavour. Some people are surprised that such a popular tourist destination serves great food. Just the fact that you are in Italy, where great food can be found virtually on every corner, helps though. Del Cambio could make average dishes, but it chose to treat its customers with excellent quality ingredients with a gentle touch of luxury. The crisp and fresh grissini wrapped in a cloth on each table are a good sign of tasty things to come. Moreover, each dish has a slightly local adaptation. 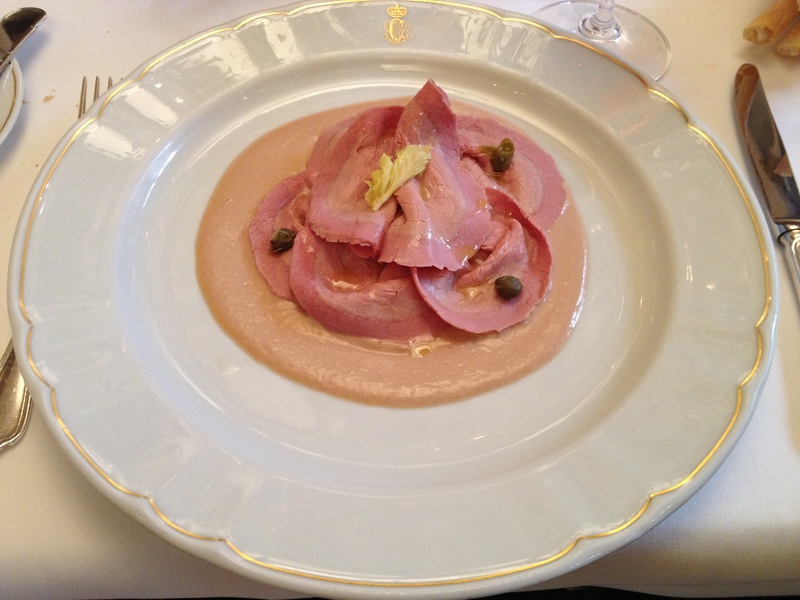 I loved the Vitello tonnato – slices of veal with creamy tuna sauce and capers. It was authentic, yet slightly different since the veal was more thick and served on the sauce instead of the usual underneath. The meat was generous and delicate, the sauce rich as it should be, the only drawback was the scarcity of capers that add more zesty freshness to this intense starter. During the autumn truffle season you can savor a number of dishes prepared with the white truffles from Alba. From scrambled eggs, cheese to meats, all of them sprinkled with this precious and aromatic fungus. The pastas are tremendous. Homemade ravioli or taglioni are great with the truffle seasoning. They have great deserts and coffee so you can treat yourself or reinvigorate after a big meal. 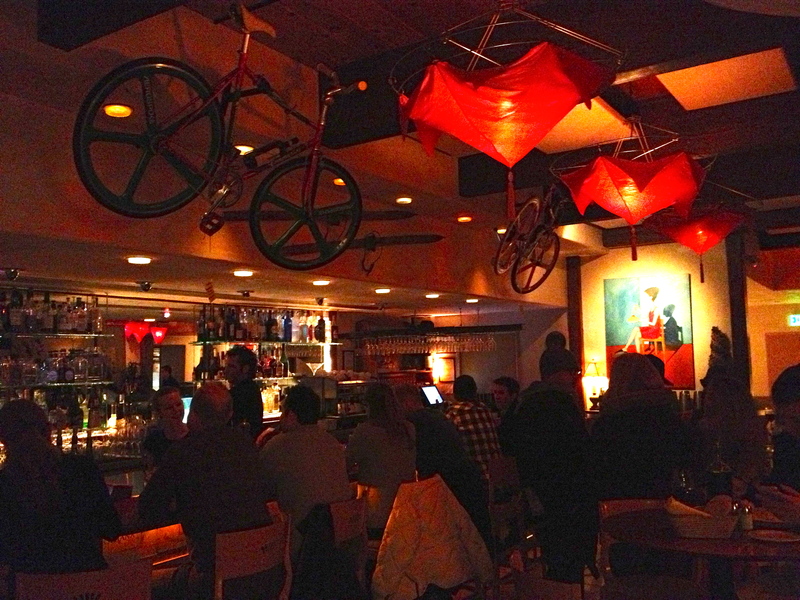 Drinks: The mostly local wine list is very good. We went for a glass of local white wine and were more than satisfied with the sommelier’s choice. The wine went well with our dishes. Price: High (starters above €20, PRIMI: first courses above €20 and SECONDI: main courses starting at €29; a 7-course tasting menu for € 70,00 or a 9-course for €90,00 are of a better value). Chef: Alfredo Russo is from Turin, but his cooking goes beyond the borders of the Northern Italian Piedmont region. With his wife Stefania he opened Dolce Stil Novo in 1990 and only after three years he was awarded his first Michelin star for his innovative Italian cooking. He also published two books “Da Idea” and “Il miele in cucina”, participated in numerous conventions devoted to high cuisine as well as in a TV show in Israel. His concept of taking traditional dishes and ingredients, elaborating them from an idea and create something new stands behind the title of his first book Da Idea. Alfredo Russo gives cooking classes at his restaurant as well so you can learn how to create Michelin star dishes like his. Atmosphere: Simple, open and classy. 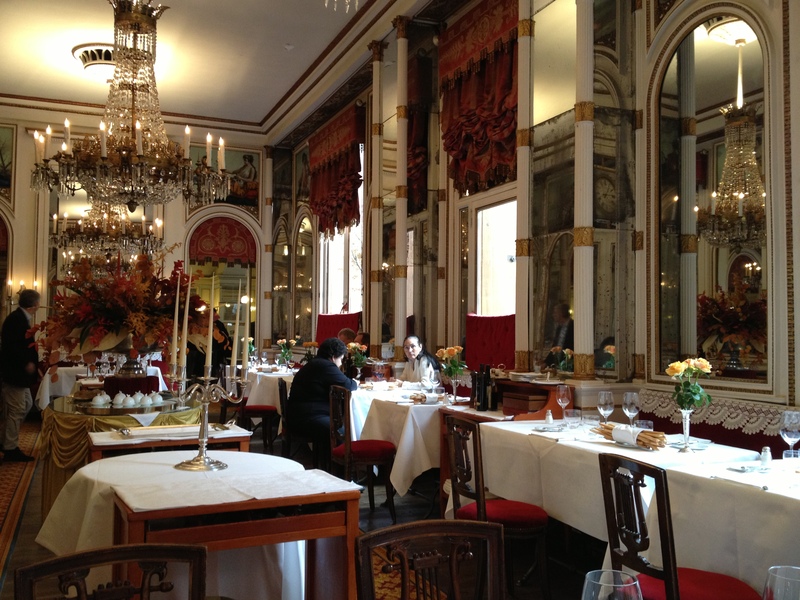 This a gastronomic restaurant located just next to the former summer royal palace of the Italian kings and it feels very upper-class. A quiet, large dining room with high ceilings and views of the palace is made as if royals were to come for a lunch or dinner here. Dress accordingly to the restaurant’s stately attire, either a jacket or a formal shirt for men and a dress or elegant pant suit for women is appropriate although it is not required. Dolce Stil Novo can be a great spot for a romantic date since the restaurant’s location in the suburban Torino near the sprawling park next to the castle invites for a nice walk before or after you eat. Food: Playful, modern and rather complex than simple Italian. I was impressed by the starter of Vitello tonnato di fassone piemontese con caramello al limone, which is one of my favorite Italian starters. Usually a thin-cut veal slices are patted with a layer of rich and creamy tuna sauce with capers in this dish, but the version of Alfredo Russo is mush lighter and elegant. He wraps the thin veal around a spoonful of the tuna sauce and adds much more of a refreshing lemon juice creating a delicious appetizer that will not fill you up before the second and third courses arrive. Great with a glass of the local red Barbaresco or perhaps some white from Gavi. Another starter or you can have it as your “secondo” is Punte di asparagi con uovo di fattoria croccante e sale di vaniglia. This is a fun plate. An asparagus cream with vanilla salt covered with cheese shavings is a discovery for most of the diners. It is creamy, yet fluffy and light at the same time. Multiple textures from creamy smooth to dry and rough mingle on your tongue as a pinch of sand on a layer of cream in a fresh milk bucket. This is one of the vegetarian dishes the restaurant offers, but there plenty of others including various pasta and rice-based plates. In the mood for seafood? Then start or continue with the lobster. 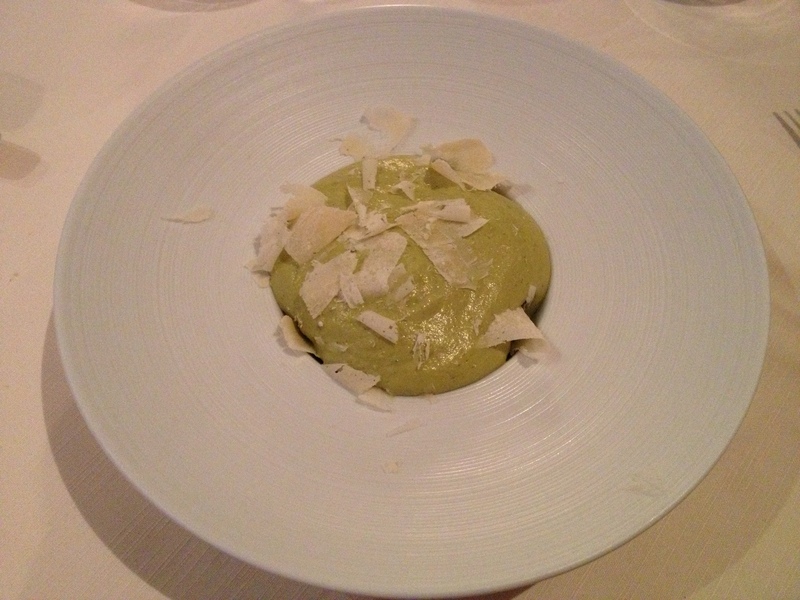 The Astice scottato alla piastra con cremoso di melanzane viola is light, fresh and juicy. The succulent pieces of lobster with juicy marinated vegetables are drizzled with a thick drops of balsamic vinegar. 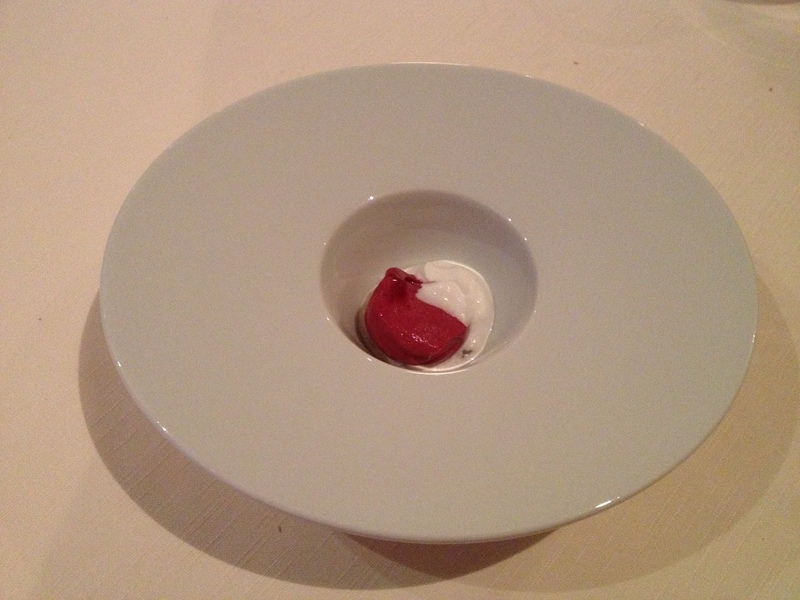 It is a nice dish for light eaters, but it was not my favorite from the menu – I found it quite boring and the lobster was far from its Maine (US state) relative, that is much more tasty and complex. One of his signature dishes also suitable for vegetarians are the “Pasta in bianco olio e parmigiano”- Alfredo Russo. In this lasagna-like pasta he combines three layers, each of a different age, of parmigiano cheese. The meat lovers will not be disappointed at this Piemontese restaurant either. The special beef main course of Spalla di manzo con intingolo alle erbe aromatiche is good but quite small, so you will still have some space for a dessert or a cheese plate. It is the most expensive meat on the menu though, so I would not pay for it. We skipped the desserts, although we got from the chef one pre-dessert of a creamy mouse with sorbet, which was delicious, and later with tea the chef treated us to a tray of chocolate and caramel lolies and small sweets so we did not miss out any sugar that night. We could not resist the wide cheese selection on a trolley. The offer of mostly local cheese from mild cow cheese to stinky blue goat cheese lets you savor the flavors of all cheese corners of Piedmont. I would not recommend the stinky goat blue cheese as it tasted like a stinky wax for all of us who tried it, the cow and goats cheeses with rind were nice though. Overall, I was a bit disappointed by the restaurant’s selection. Italy has excellent cheeses, so why not to show these instead? Drinks: The wine list has a great selection of price-friendly local wines. It was a pity though that the sommelier recommended us wines that we did not love as they did not correspond with our requests and her description. The choice and quality of teas is tremendous! 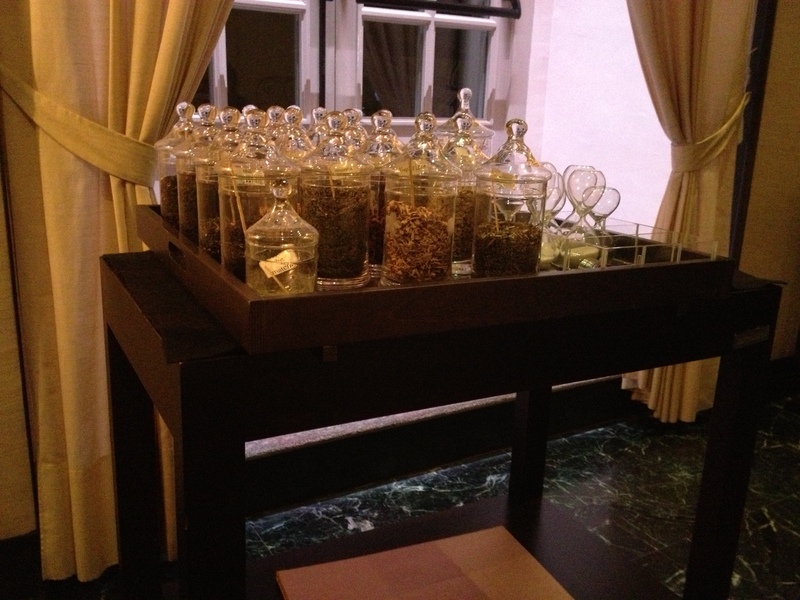 Having a cup of a local herbal blend after a multiple-course dinner is all one wishes before getting to bed. You get a small hour-glass to measure exactly the length of steeping your tea in water, so you can remove it in time to obtain just the beneficial substances from the tea. Many restaurants and even tea houses neglect the right steeping time for teas, so I give a huge credit to Dolce Stil Novo for making the tea experience proper for their guests. Opening hours: Dinner: Tuesday to Saturday: from 8:00 pm to 10:00 pm; Lunch: daily from 12:30 pm to 2:00 pm except on Monday and Tuesday. Contact: Tel: +(39) 011 4992343 – Mob: +(39) 339.1996218; Reservations are required for both lunch and dinner.